It’s time for a serious event, today. Every Tuesday for a fair few weeks now, I’ve talked about a tabletop game that I really enjoy, but today I’m going to make something of a feature by talking about my absolute favourite card game that has ever been made, ever. 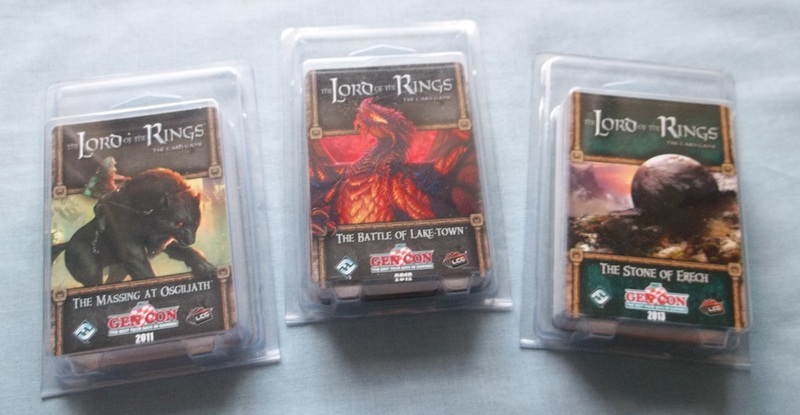 I’m talking, of course, about The Lord of the Rings: The Card Game. Published by Fantasy Flight Games in 2011, this is just such an enjoyable game, I can barely begin to get my words out to describe how much I enjoy it. 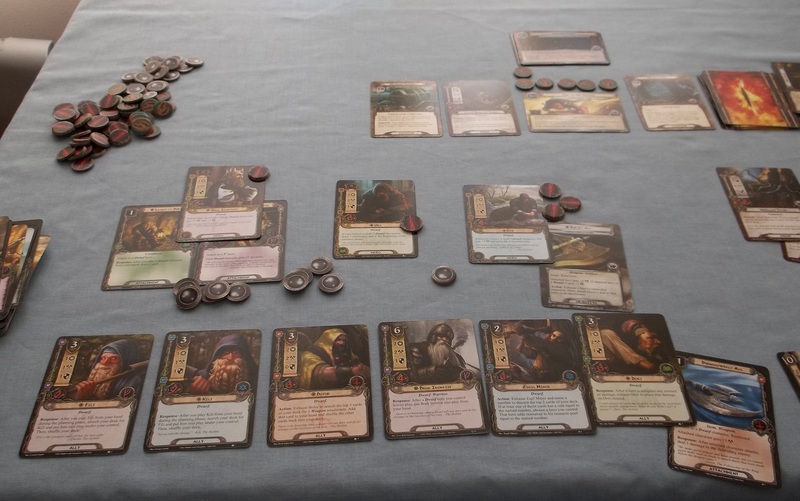 A Living Card Game like Call of Cthulhu and Star Wars, Lord of the Rings is actually a game on its own as it is the only co-operative LCG they publish (in fact, I think it was the first co-operative card game, though that might just be hyperbole). Rather than playing against each other, therefore, the players compete against the game itself, by means of an encounter deck. Expansions take the form of new scenarios/quests (call them what you will!) that provide new encounter decks to play against, along with new player cards. The game has, therefore, grown much slower than its peers, but that is really beside the point. It is just such a beautifully crafted game, I will only scratch the surface of its awesomeness in this blog! For illustrative purposes, I was going to stick to just one deck and play through just one scenario, but that seemed a little boring. Instead, I’ve got an amalgam of several games, and at least three different decks, the better to show off the variety of the game. However, in this blog I intend to just discuss the base mechanics of the game, and give some thoughts about the game overall. I then hope to devote separate blogs to discussing the expansions at future dates, though these will most likely involve a discussion of the quests, and not the player cards, simply because I keep all of the cards together in the core set box. Anyway, let’s move on! The game is played by one or two people playing together to beat the encounter deck of any given scenario. 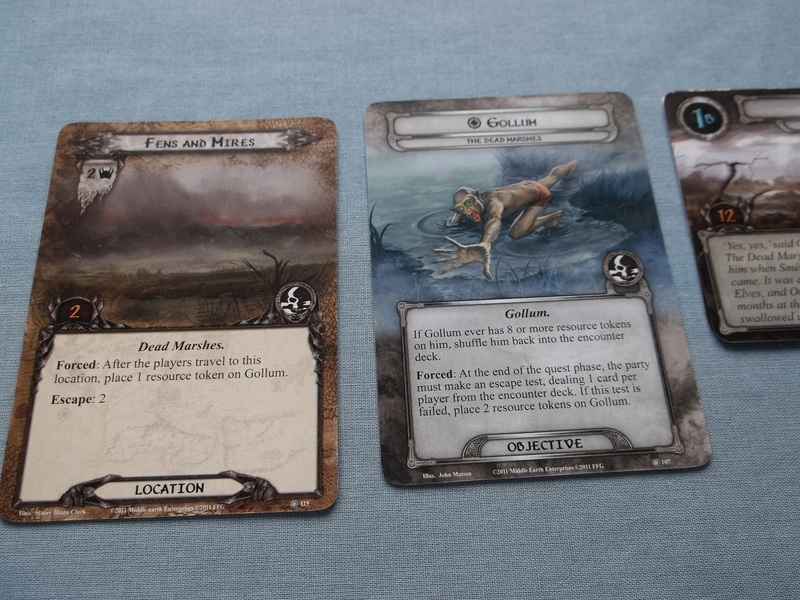 In the core set and each subsequent deluxe expansion, there are three separate scenarios; the smaller Adventure Packs bring one new scenario each month. The game model features a group of encounter sets that are mixed together to form the encounter deck; while each Adventure Pack features its own unique encounter set, it will also use a number of other encounter sets. 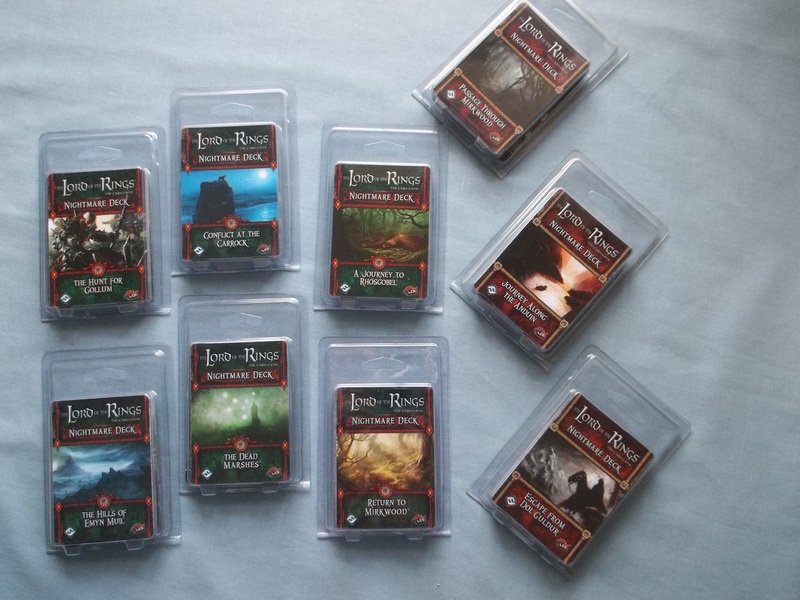 The model of release FFG has chosen is to have a cycle of six Adventure Packs linked to a deluxe expansion box; each pack uses at least one encounter set that comes from the linked deluxe, with the initial cycle of six being based of encounter sets found in the core set. This sounds an awful lot more complicated than it actually is, however! Encounter sets feature a variety of card types, most commonly enemies, locations and treachery cards. Enemies have to be fought in order to be defeated, and locations have to be explored to clear them. Until these things happen, the cards are kept in the ‘staging area’, where they contribute a threat total (threat is shown at the top-left of encounter cards). 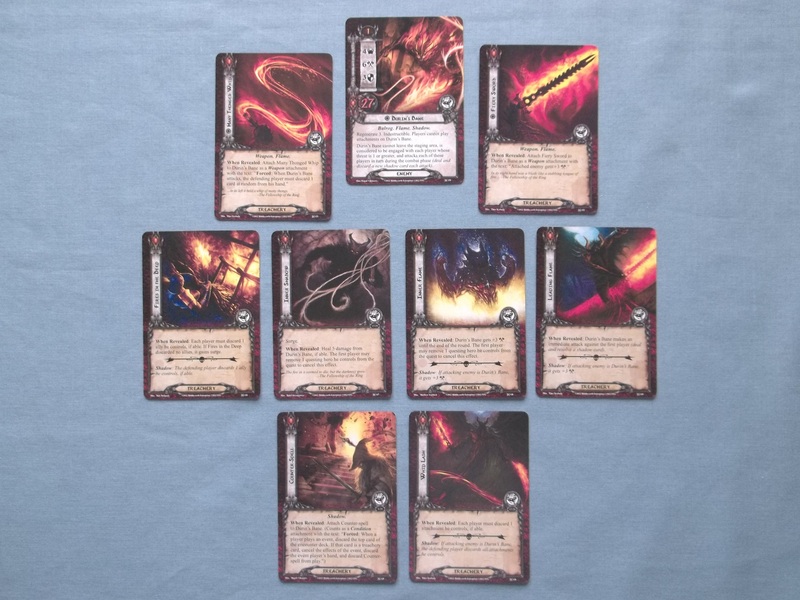 Seen above, enemy cards have values for threat (4), attack (7) and defense (4), as well as their hit point value (how many hits are needed to kill them; 5). The text box at the bottom then gives any special effects that enemy may have, and the number in the blue circle at the very top-left is the engagement cost – if your threat is equal to or greater than the engagement cost of an enemy, that enemy comes down from the staging area and starts to fight you. This can sometimes be a good thing, as it means they no longer contribute threat. In combat, you have the option to commit any number of characters as defenders, in an attempt to soak up any damage the enemy may dish out, before you can then commit another group of characters to attack said enemy. 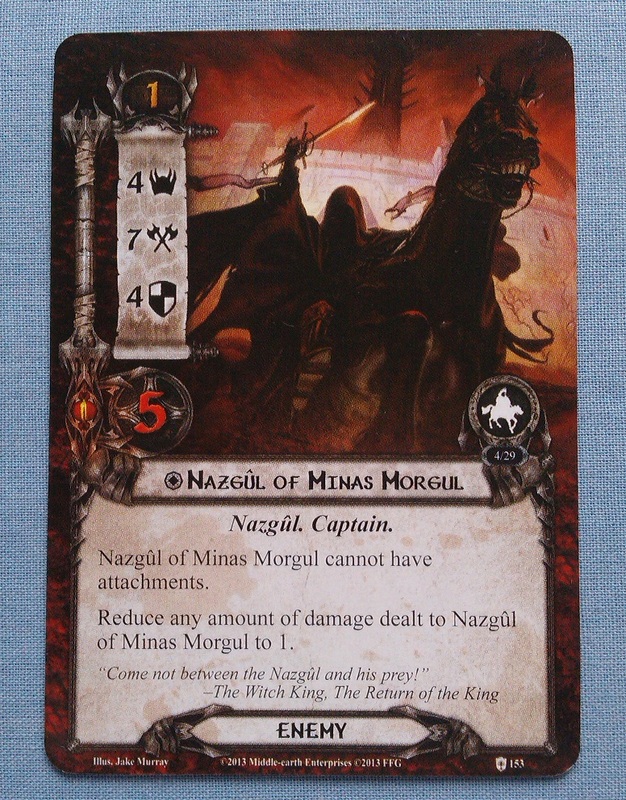 With the Nazgul above, you would need to commit characters with a combined defense of 7 or higher to ‘avoid’ the attack, otherwise damage is assigned and can potentially kill characters. If you don’t commit defenders, the attack is undefended and all the Nazgul’s damage is dealt to one hero – as most heroes only have a base health of 5 at best, the Nazgul could potentially kill a hero! Locations contribute threat to the staging area, making it increasingly difficult to quest successfully the more you uncover, but you have the option after the quest phase to travel to a location. If you do that, the location becomes ‘Active’, often triggering an effect. That on the Morgul Vale, above, is a passive ‘always on’ effect, however. The number in the blue box on the middle-left is the number of quest points needed to clear the location. When questing, active locations have any progress tokens placed on them before on the quest. One of the great thematic moments of this game is seeing an expansive location with a high number of quest points, indicative of the vast area you have to traverse before it contributes any success to your quest! Finally, there is a Shadow effect on the above location. During combat, once defenders have been declared, an attacking enemy is dealt a shadow card from the top of the encounter deck face-down to it; when combat begins, that card is turned face-up, and any Shadow effect is resolved. Not all encounter cards have Shadow effects, but they are universally bad, often buffing attacking enemies. 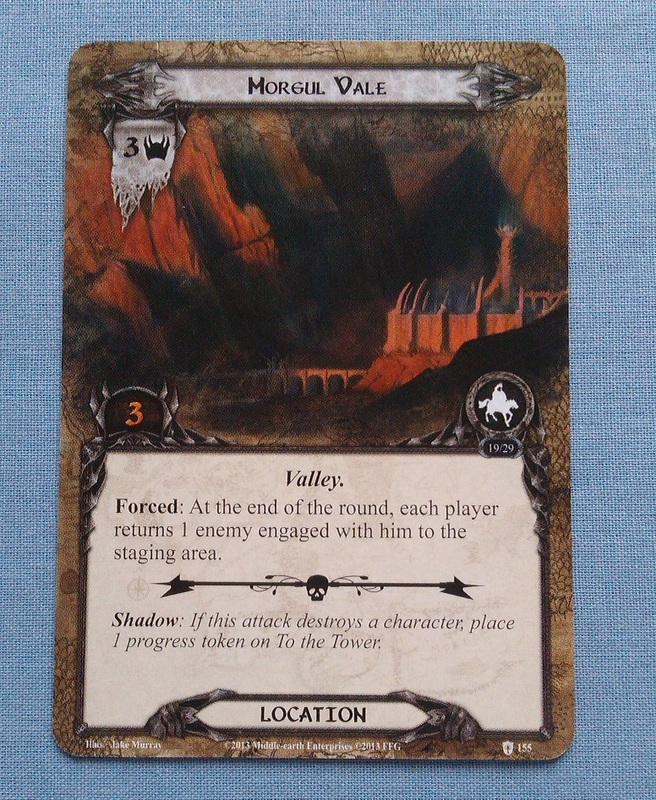 The specific effect on The Morgul Vale above refers to an Objective card in the Morgul Vale scenario called To the Tower, which is a critical card in that quest. Finally we have Treachery cards. As the name suggests, these cards are just awful. Analogous to player Event cards, they usually have a one-time effect such as that above, and a high number also carry keywords such as Surge (reveals a second encounter card as soon as the current card is resolved) or Doomed (increases your threat level by a specific number). 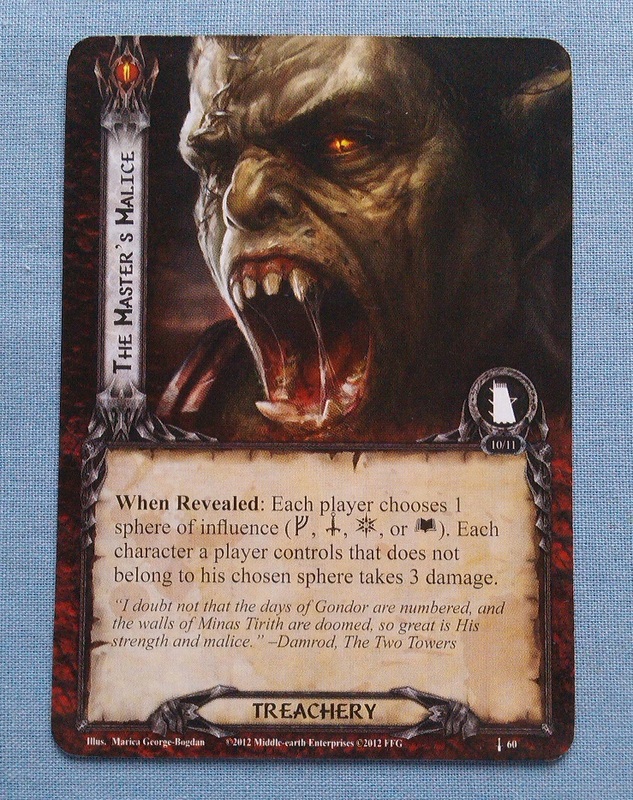 I have never met a Treachery card that I like, but some have become the targets of particular hate – the most notorious perhaps is Sleeping Sentry from the Dwarrowdelf cycle, which damages each exhausted character but, when dealt as a Shadow card, discards each exhausted character. It is a potentially game-losing card, and there are two copies in the deck! So yeah, Treachery cards stink. Encounter decks vary in difficulty, and also in inner synergy. Earlier quests are almost very vague, as if the game was still finding its feet and whatnot. But subsequent expansions have really improved upon this, and nowadays the quality of quests we’re seeing is usually cause for awesomeness! My particular favourite encounter deck comes in the Dwarrowdelf cycle, Shadow and Flame. The quest is brutal, and I actually dislike playing it because I often find it so difficult, but that doesn’t stop me appreciating just how amazingly put-together the deck is – it’s almost like you would expect from a real player, with cards that work off each other to make an often-impossible strategy. In addition to the three card types outlined above, the encounter deck can sometimes contain Objective cards. Early games experimented with the types of cards we’d see as Objectives, and the game as it stands right now has seen a whole gamut of types. Unsurprisingly, these cards have a specific function within the game, such as allies that you are escorting, or creatures you’re guarding. The implementation of Objectives in a set is something that I absolutely love and always look forward to seeing, just because of the sheer variety such cards provide. The main focus of the game is for the players to complete a quest by putting progress on the quest cards – to do so, they must commit units that have a combined willpower value that is greater than the combined threat total of the encounter cards in the staging area. If they are successful, the players place progress on the quest; if they are unsuccessful, they must raise their threat dial by the number of points they were unsuccessful – once the threat dial reaches 50, the game is over. If the players complete each stage of the quest, they win! 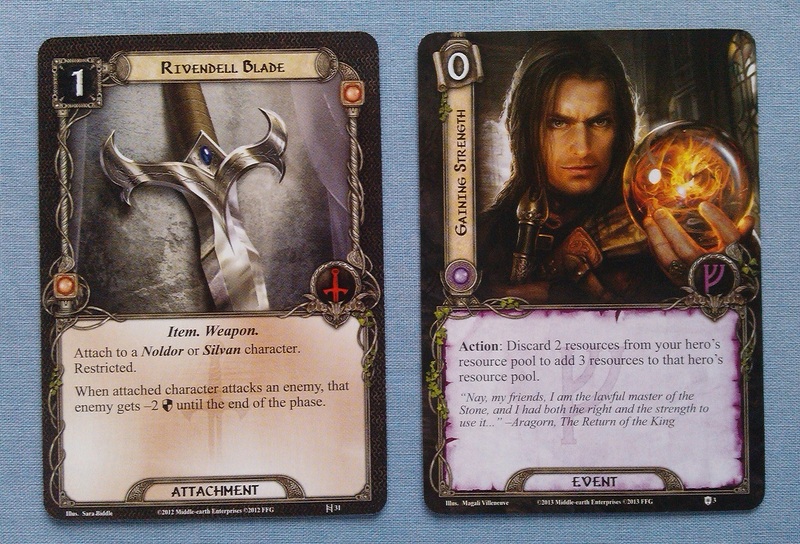 Quest cards, shown above, are double-sided. Side A has some sort of Setup instruction, usually revealing one card per player as shown above, but quite often now we’re seeing more complex setups that involve setting aside specific cards. By far the most complicated, to my mind, is that for The Steward’s Fear, the setup for which is too much to fit on the card so is contained on a leaflet inside the pack. (That quest, incidentally, is one of the very best, so don’t be put off by the complexity!) Once Setup is complete, the card is flipped to the B side which shows the number of quest points needed to clear it (in the above example, 10), as well as often having some kind of ongoing effect while that stage is in play. Once the number of quest points is reached, the card is immediately flipped for stage 2, and so on. The player cards vary from allies (units), attachments and events. Heroes are central to the game, and never get mixed into the deck but are on the table at the start. 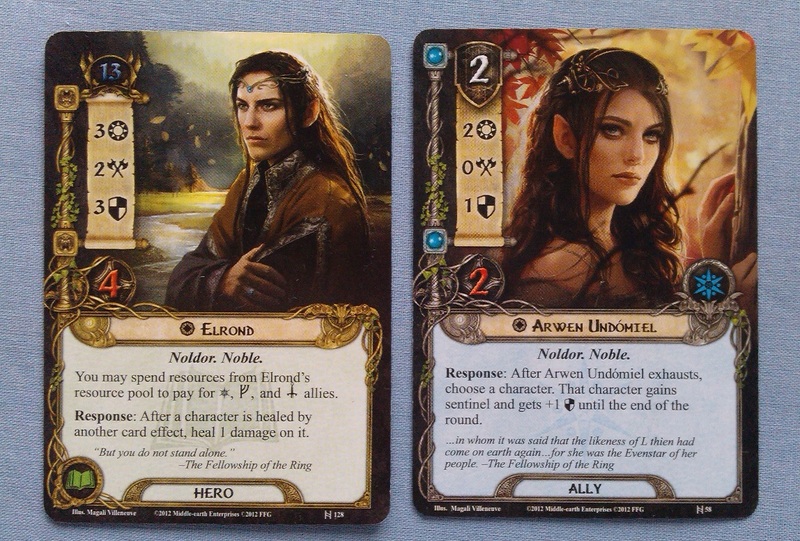 They are almost identical to allies (both of which are shown above), except that rather than having a cost to play during the game (Arwen costs 2, as shown above), they have a Threat cost (Elrond is 13) – this cost is added together from each hero at the beginning of the game to determine your starting Threat. Similar to the Enemy cards described earlier, Heroes and Allies have an attack and defense rating, with a willpower value in place of the threat. It is this value that is added together from all the questing characters and compared to the current threat in the staging area to determine success during the quest phase. The other player cards are attachments and events, as shown above. Quite simply, attachment cards attach to a character (sometimes, expressly a hero) and provide some form of bonus. Event cards are one-off, well, events, intended to provide a boon to the heroes in some form or other, from adding resources (as above) to damaging enemies. Player decks are built around a core of three heroes (though you can use two if you like), who each belong to a specific sphere – lore, leadership, spirit and tactics – which determine which cards you can use in your deck. Heroes collect resources each round, and you can only pay for cards with resources from a hero of the same sphere. Deckbuilding encourages mixing the spheres, so that you can have dual-sphere, or even tri-sphere and monosphere. The addition of ‘song’ cards, as well as other little tricks, can give a hero two spheres, allowing for greater flexibility. There are also neutral cards that can be paid for with resources from any hero’s pool. 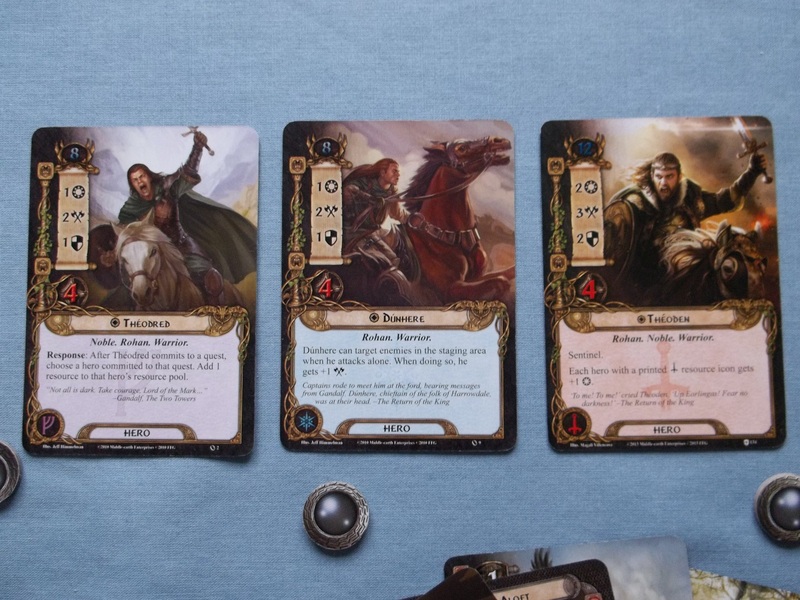 The heroes shown above belong to Leadership, Spirit and Tactics, left to right, and form the core of the Rohan deck that I like to take through adventures in Middle Earth. The deck has evolved over time to include new cards where appropriate, but it says a lot for the replayability of the core set that, three years on from the initial release, and with a wealth of player cards to choose from, two of these three heroes are found in the core set. In terms of the meta, Rohan was a trait that developed very early, so a lot of the useful cards came out in that first year’s run, but in terms of game balance, my Rohan deck is still perfectly viable against the newer quests, showing just how well-designed the game has been throughout its growth. The core of my Rohan deck, shown above, has a strong emphasis on questing, and therefore, willpower. 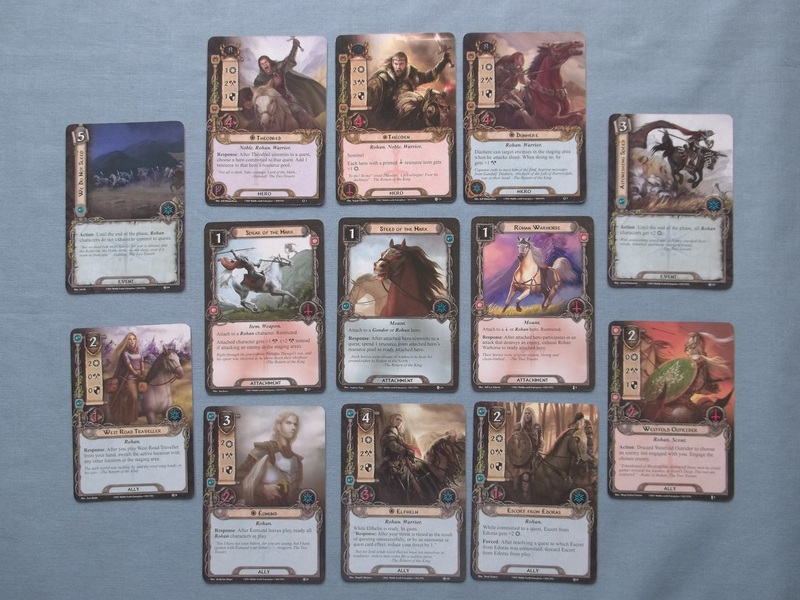 Allies (shown along the bottom) often have high willpower, or effects that can work towards threat reduction; events (the two cards either side of the row of the heroes) work to increase the combined willpower of the fellowship, and the attachment cards in the centre allow the heroes they are attached to either to make better attacks, or to take more than one action. Always handy! 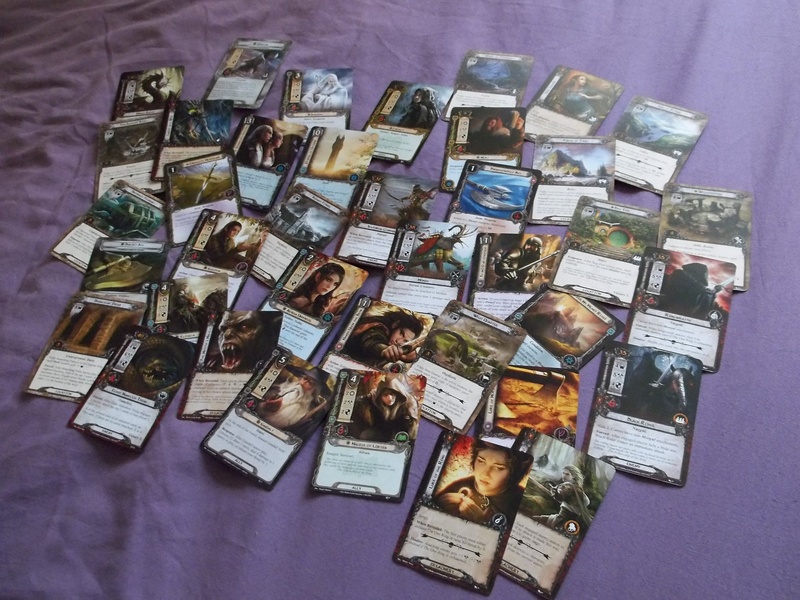 Of course, this isn’t the entirety of the deck, as usually the decks I play with are at least 30 cards (for official tournaments and the like, 50-card decks are the minimum requirement. However, I do not play in tournaments). I don’t pretend to be a massive strategist when it comes to any game, and I wouldn’t pretend to do so here either. But I have played this game quite a lot, so I would say I do know my way around it. 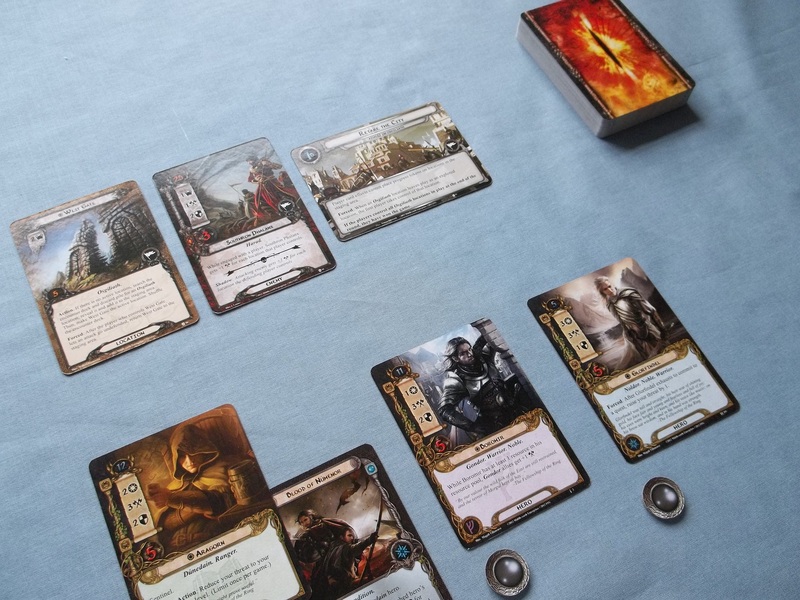 However, I am always one to play thematic decks – the sorts of decks that feature all-dwarves, or all-elves, or an alliance between Gondor and the Outlands. 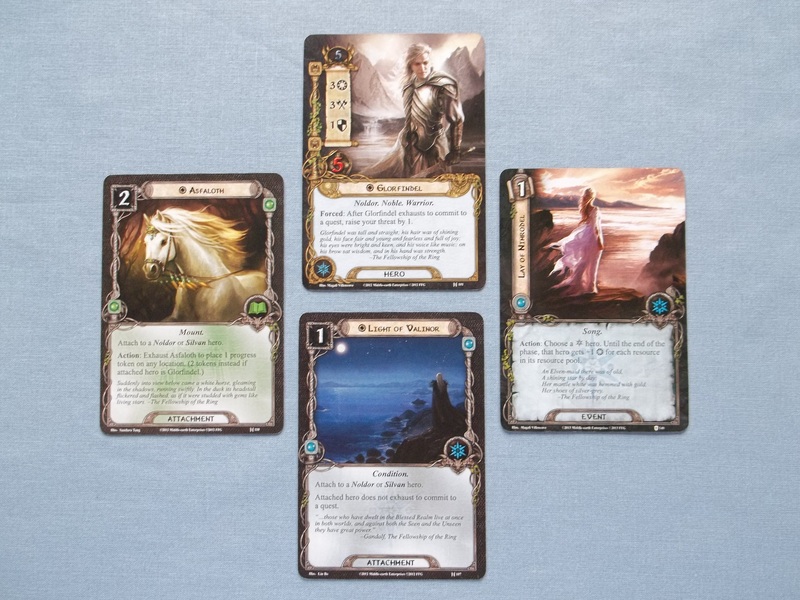 These things I really enjoy, and the card pool is expansive now that you can set up all sorts of nice little combos, such as the Glorfindel-themed set shown above, which allows you to do a lot of stuff with one hero. However, there are also ombinations of cards that can do all sorts of weird and wonderful things, from locking down the encounter deck so that you can win in two or three turns, to cards that form infinite loops and can, for instance, allow you to draw your deck into your hand before turn one is over. While I wouldn’t say you shouldn’t play like that, because that sort of thing isn’t it up me, what I would say is that sort of thing can’t be fun – if you know you’re going to win a game, where is the enjoyment? 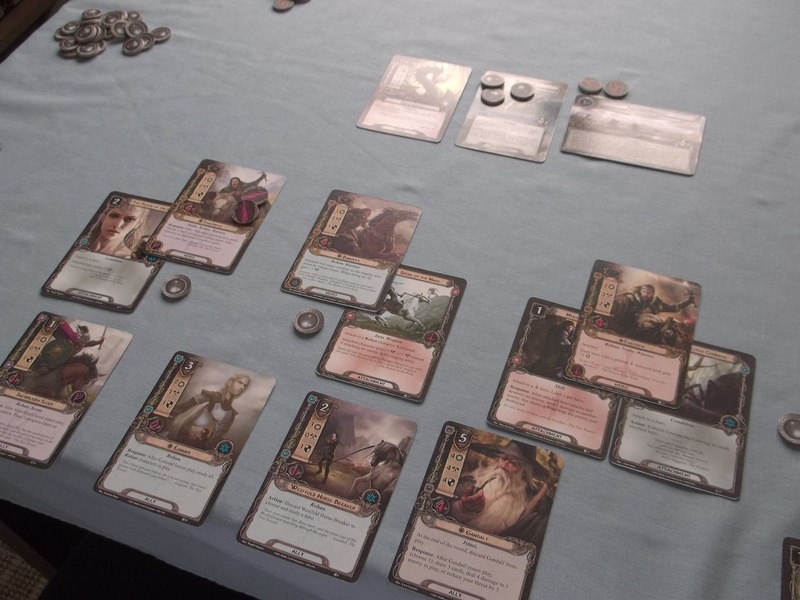 For me, the great thing about Lord of the Rings LCG is that it can be really quite tough, so you never know when you’re going to win or lose. I play for a love of the theme and the general joy that I derive from wandering around Tolkien’s world, not because I can “beat” the encounter deck. And this game is exceptionally thematic! 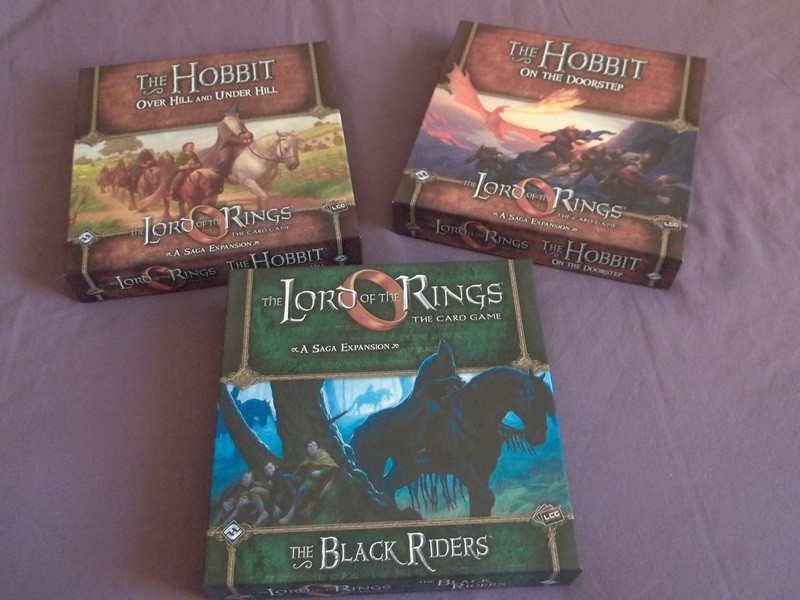 The “general release” game is the model of one deluxe expansion followed by a cycle of six adventure packs, as described previously, and each cycle like this follows an often highly-specific storyline. So the Mirkwood Cycle followed the tale briefly mentioned in the Appendices, where Aragorn tracked down Gollum through the forest of Mirkwood. The Dwarrowdelf Cycle sees us on a mission for Elrond to investigate the reports of increased Orc activity in the region of the Mines of Moria. The third, Against the Shadow Cycle has an almost-RPG feel to it as we are sent on a mission by the Steward of Gondor to root out a potential spy from Mordor within the city. We are now currently poised on the brink of the fourth, Ring Maker Cycle, which deals with the area of Dunland around Isengard, where we are working for Saruman (who, at this point in the lore, has not revealed himself to be in league with Sauron). 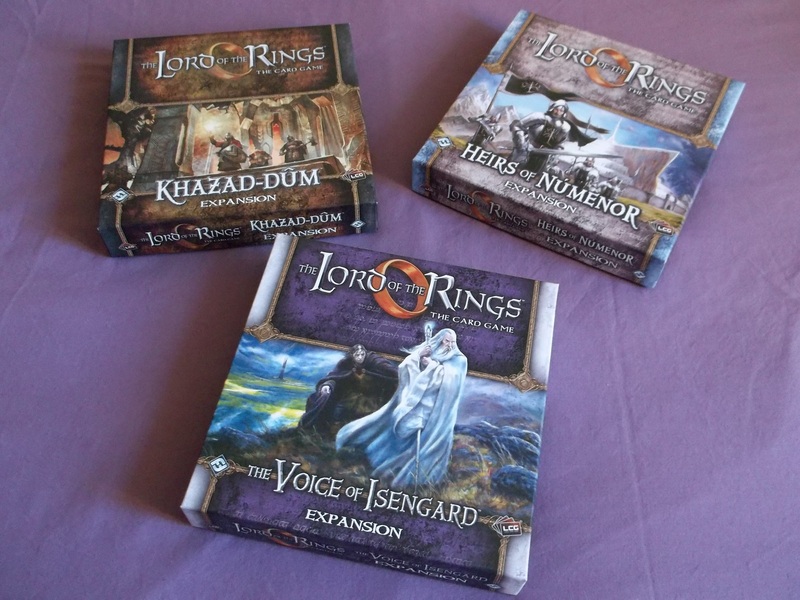 In addition to these, Fantasy Flight have also been releasing Saga Edition deluxe expansions, which are roughly released annually and re-tell the events of the actual books, The Hobbit and The Lord of the Rings. We’ve currently seen two Saga boxes of Hobbit-themed quests, and one telling the early adventures from The Fellowship of the Ring. 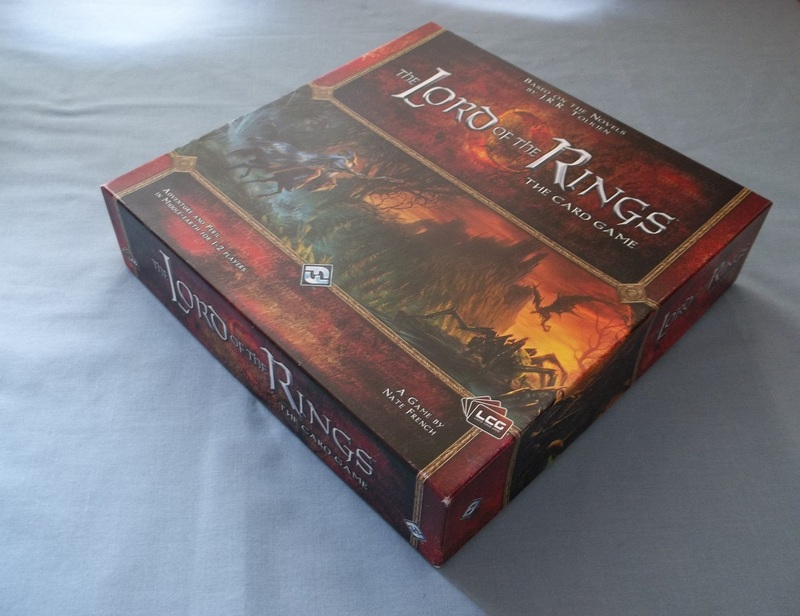 These boxes stand slightly apart from the main game, as they are intended to be as thematic as possible, but there are always ways for players to get around these things if they really want to, and use inappropriate cards in the quests (for instance, Frodo in the Hobbit quests, or Thorin Oakenshield in the Fellowship and beyond). Fantasy Flight need to be commended for the level of support they have shown this game, specifically through the addition of the Print On Demand resources for the game. 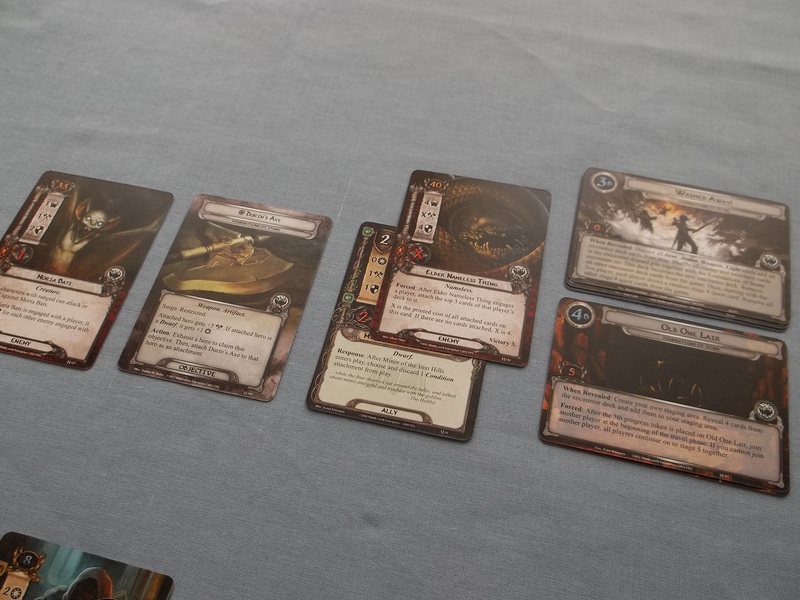 Rather than being issued for general release, FFG have created special scenarios for GenCon every year since the game was released, later being sold through their webstore. These scenarios are often quite difficult, but are also really very good to play against. The release of Nightmare Mode cards is also wonderfully done. To reflect the changing metagame, and to reinvigorate older scenarios, a programme of ‘Nightmare decks’ has been steadily issuing to essentially revise the old quests and make them more difficult for seasoned players. One of the big complaints about the game has often been the unchanging nature of the encounter deck, hence the need for ever-different quests, while the player-card pool keeps expanding. With the Nightmare Mode decks, however, old quests are spiced up with new cards being swapped-in, almost as if it is a real player who is taking advantage of new cards being released for him. Some of the Nightmare cards are truly horrific, and make what were once thought of as easy quests so much more difficult. From last Autumn, to balance the increasing difficulty of the “general release game”, an Easy Mode was also introduced, which basically removes cards from the encounter deck that are either very difficult to overcome, or else occur multiple times and can often lead to exasperating difficulty for players. Easy Mode isn’t really “easy”, and many people think it would have been wiser to call it “thematic mode” instead, but there we are. The game is just absolutely beautiful. The breadth of the game is stunning. There is very little else I can say about it, really, just – go out and buy it!